BMB Lecturer Ludmila Tyler was named one of five recipients of the 2019 CNS Lecturers’ Professional Development Fund award. The award provides funding for activities that contribute to their scholarship and effectiveness as teachers and mentors. Dr. Tyler will use the award to attend the Cold Spring Harbor Laboratory’s Statistical Methods for Functional Genomics short course. Lila Gierasch, Distinguished Professor in Biochemistry & Molecular Biology and Chemistry, was selected by the American Peptide Society to receive the 2019 Merrifield Award in recognition of her outstanding contributions to peptide science. The award named in honor of R. Bruce Merrifield recognizes the lifetime achievement of a peptide scientist. Gierasch will be presented with the award at the 26th American Peptide Symposium in Monterey, CA, on June 22-27, 2019. BMB Professor David Gross has been named the recipient of the first Normanly Award for Leadership and Innovation in Teaching. This annual award, supported by an anonymous gift in honor of department head Jennifer Normanly, recognizes exemplary teaching and service by BMB faculty. Prof. 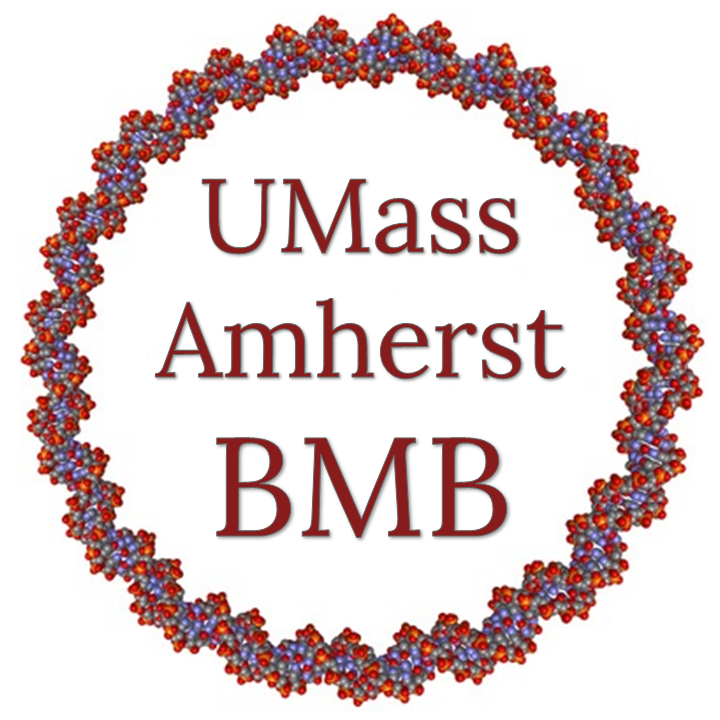 Gross has made numerous contirubutions to STEM pedagogy throughout his time at UMass, and will be recognized on May 2nd at the annual BMB Awards Ceremony. BMB Associate Professor Peter Chien recently received a five-year, $1.8 million NIH Maximizing Investigators’ Research Award (MIRA) to fund research into how bacterial cells manage stress responses. Chien, who is director of the Models to Medicine Center in the Institute of Applied Life Sciences at UMass Amherst, says that most bacteria are now resistant to commonly used antibiotics, and “the protease-based pathways we study in our lab represent new avenues to target as we look for new ways to fight drug resistance.” Chien is not the first BMB faculty member to obtain the coveted MIRA award - Lila Gierasch, Distinguished Professor of Biochemistry, and Dean Tricia Serio of the College of Natural Sciences are also recipients. Edridge D'Souza, a senior in the Biochemistry & Molecular Biology Department and the Commonwealth Honors College, was recently awarded the prestigious Churchill Scholarship. This award, valued at about $60,000, provides funding to American students for a year of post-graduate study at England’s University of Cambridge. Edridge plans to continue his goal of integrating traditional biology with next-generation computational techniques and complete a master’s program in Functional Genomics. BMB Assistant Professor Sibongile Mafu was selected as a 2018 recipient of the Smith Family Awards Program for Excellence in Biomedical Research. The award supports newly independent biomedical researchers to help them achieve medical breakthroughs. Dr. Mafu will use the three year, $300,000 award to continue her work on the discovery and mechanism of plant-derived antifungals. She is only the third researcher from UMass Amherst to receive the award since 1992, and the first since 2005. Three seniors in the Biochemistry & Molecular Biology Dept were named Rising Researchers by Research Next at UMass Amherst. Bianca Edozie works in the Ross lab to explore various behavioral aspects of microtubules. Nicholas Fragola is a member of the Tyson lab, where he works on finding a cheap, simple, and accurate way to measure arsenic levels. Taylor Guertin studies the role of Bone Morphogenetic Protein (BMP) signaling in liver development in the Tremblay lab. All of the Rising Researchers will be honored for their achievements at a Chancellor's reception in April. Elana Carleton, a freshman in the Biochemistry & Molecular Biology Dept and Commonwealth Honors College, was recently awarded a $10,000 scholarship from the Alliantgroup Blue Heart Fund STEM Scholarship Program. Recipients are selected based on a short YouTube video or 500-word essay where they describe their interest in STEM and how the scholarship would help them achieve their goals. Lila M. Gierasch and her research team recently published a paper in PNAS exploring the differences between bacterial and mammalian heat shock proteins (Hsp70s). Scientists have been relying on the bacterial version of Hsp70s in their research, but the Gierasch lab reports that Hsp70s from mammalian cells behave quite differently from bacterial Hsp70s. These evolutionary variations will help scientists learn to "tune" Hsp70s as a way to treat certain protein misfolding diseases.